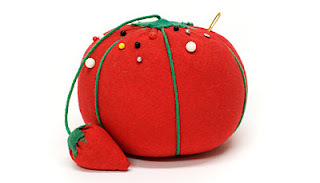 Whenever I sew I usually end up with a few pins still in my tomato pin cushion, which I usually lose, and several all over the table and even more on the floor. I found a great idea to make a pin cushion that I tie around my machine. I just stick my pins in after I pull them out of my project instead of digging for my tomato cushion or just leaving them on the table. I got the idea a couple years ago from I Can Find The Time. Love this! What is in the inside?